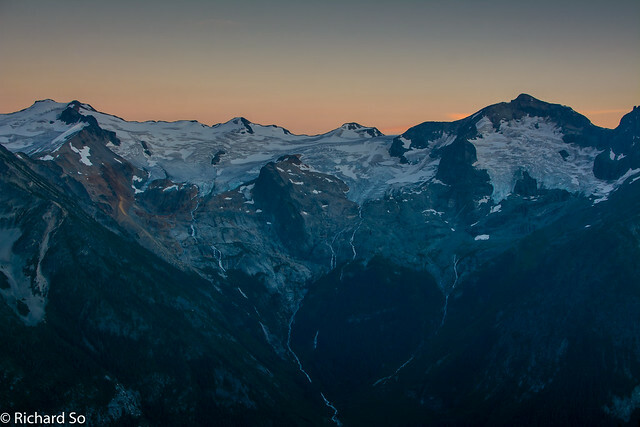 I've always wanted to check out the Stein Valley, a vast wilderness east of Pemberton. 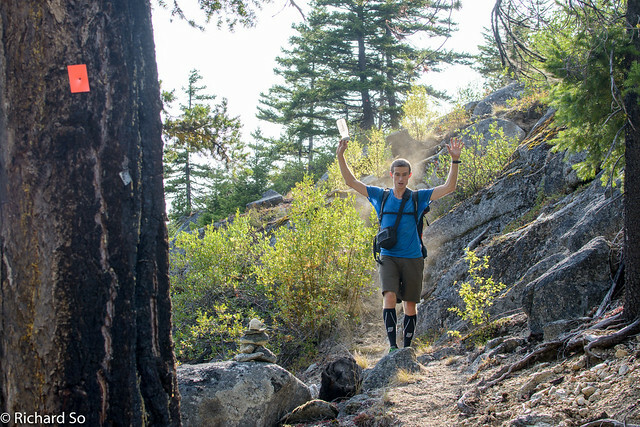 Most of the traffic these days are on the east side, where a well maintained trail leaves Lytton in the Fraser Canyon and meanders up the Stein River. 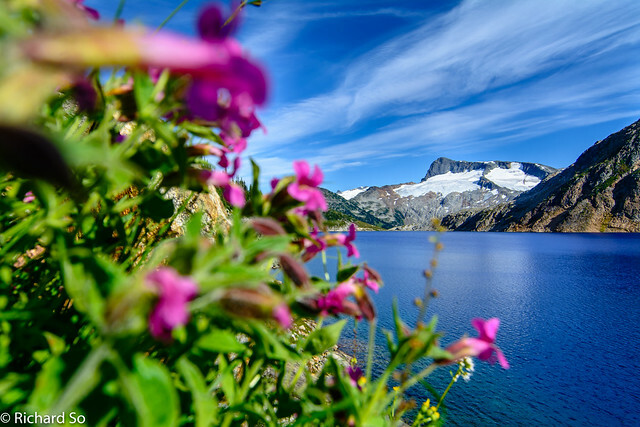 The showpiece is definitely the full Stein Traverse, from Lizzie Lake to Lytton, which requires a long car shuttle, and usually 6-9 days to complete. 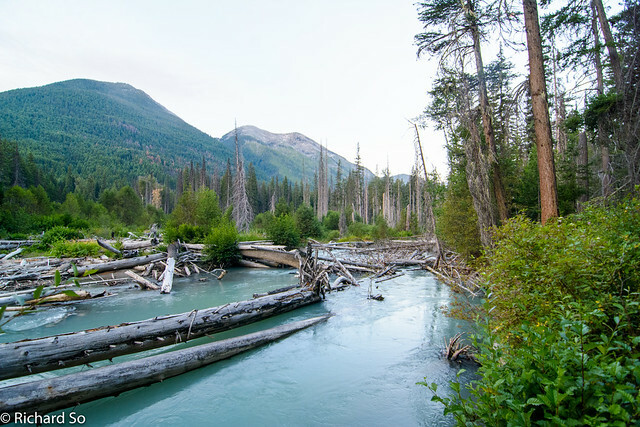 Over the last couple years, access and trail conditions have deteriorated with washouts on the Lizzie Creek logging road, and forest fires in the lower valley in 1996 and 2009. Many parties still complete the full traverse each year, always finding it challenging and a satisfying accomplishment. The Stein is one of those special places, the only watershed in the southern Coast Mountains that has never been logged. 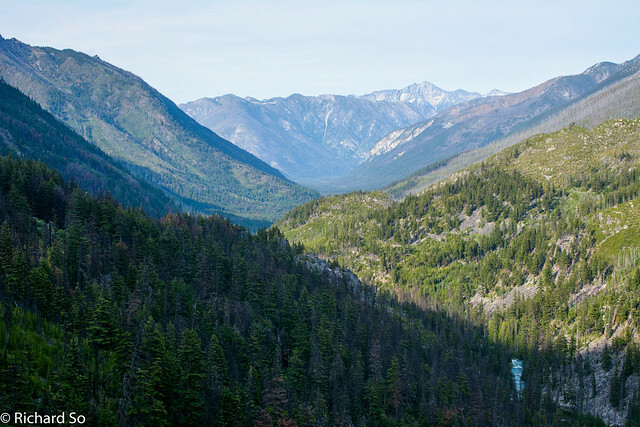 There were plans to begin logging in the 80's, but thanks to environmentalists and strong public support, the entire waterhsed was protected as the Stein Valley Nlaka'pamux Heritage Park on November 22, 1995. 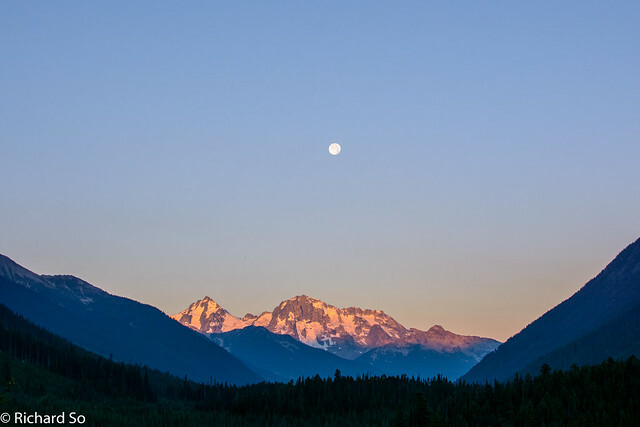 This area is an important spiritual land for the First Nations in the area, and the name "Stein" comes from the Nlaka'pamux workd "stagyn", which means "hidden place." 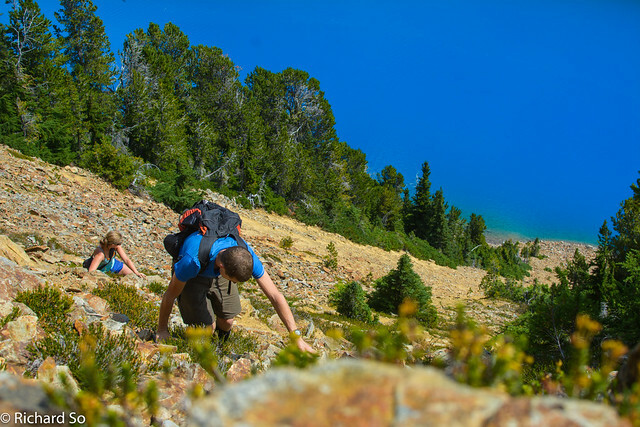 The Stein Traverse is a special trip, which allows you to visit the full spectrum of what the Coast has to offer, going from the alpine tundra terrain around Lizzie Lake, along the floodplain forests in the mid-valley, and down to the dry interior zone by Lytton. 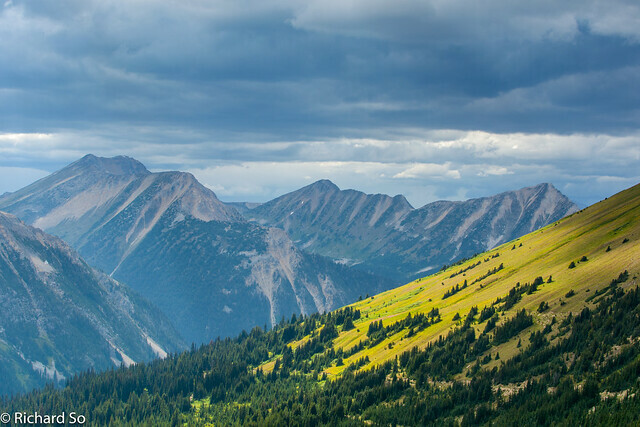 The Stein Valley traverse takes you from dry ponderosa pine forests in the lower valley, stands of Douglas fir in the mid-valley, and hemlock, cedar, spruce and fir in the upper valley. When Alex and Maddy suggested doing a "casual" three day trip through the Stein for the August long weekend, I was completely onboard. Alex and others had done the Stein Valley from Lizzie to Lytton, in 28 hours, a impressive effort, but they missed out on the views, and the lakes and other gems that the Stein has to offer. 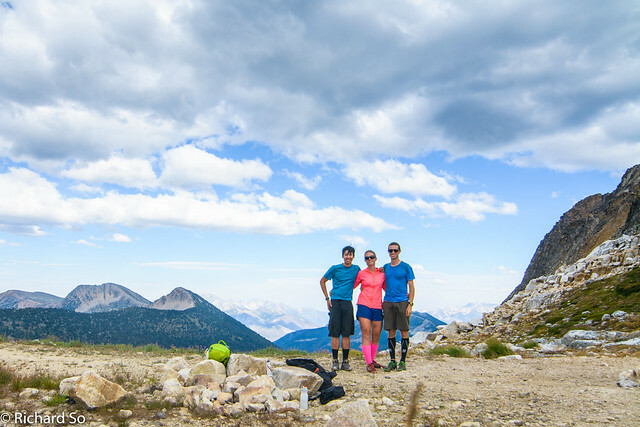 Logistics can get complicated for a traverse, but our plan was to do a modified route, starting from the south at Lizzie Creek, and hiked north to Blowdown Pass. This was partly to reduce the driving time, but Alex also has bad memories of the trail east of Cottonwood (because he did it in the dark). On Saturday morning, we dropped off one vehicle on the Blowdown Creek FSR on the south side of the Duffey Lake Road. The main branch of Blowdown FSR was in good 2WD conditions, but the upper branch to the pass requires 4x4 HC due to rough washouts on the road. We left the truck before that section, as I didn't think my Tracker would get up it, and then drove back down the Duffey, along the east side of Lillooet Lake and another 500m up the Lizzie Lake road. The road is more overgrown higher up, but still easy walking. It only gets a bit worse than this. Photo by Alex Gibbs. There are two options here, either ford the washout, or continue up the road past one switchback to find a flagged trail, which bypasses the washout by contouring on the hillside above, before rejoining the road. In low water, the washout is easy to cross, and I've done it with flipflops and garbages bags, my makeshift waders. To cross back to the other side from the bypass trail, either shimmy across a smooth log, or look further upstream for an easier crossing. In 2010, the VOC brushed out the part of the road during a summer weekend, but the alder has grown back since. Despite not seeing much except for green leafs and branches on the 10km up the road to the lake, it was still fast going and we reached the lake after 2 hours from the car. Apparently people have helicoptered into Lizzie Lake to avoid walking up the road, but that's just silly. I'm planning to pay a visit here again with the VOC in November with loppers, pruners and brushcutters to clean up the road. Let me know if you want to help out. Hopefully we can make access better for future winter and summer trips! At least for another few years. The trail from Lizzie Lake to the old Lizzie Cabin is still in good shape, aside from some large deadfall on the trail which would require a chainsaw to clear out. 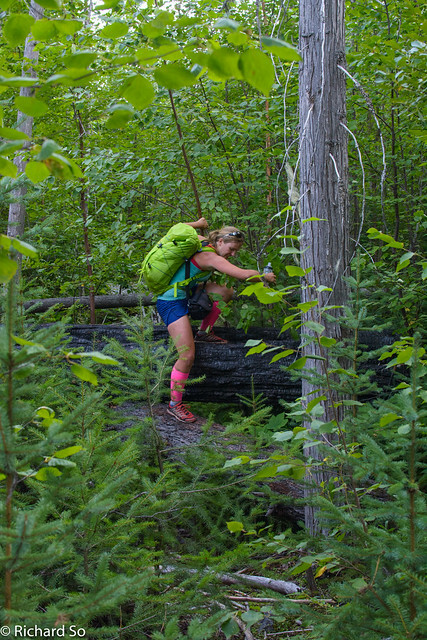 With our light packs, we didn't have trouble climbing over the deadfall, something that became a theme of the trip. With large packs, I think climbing up and over the trees would become tiresome quickly. 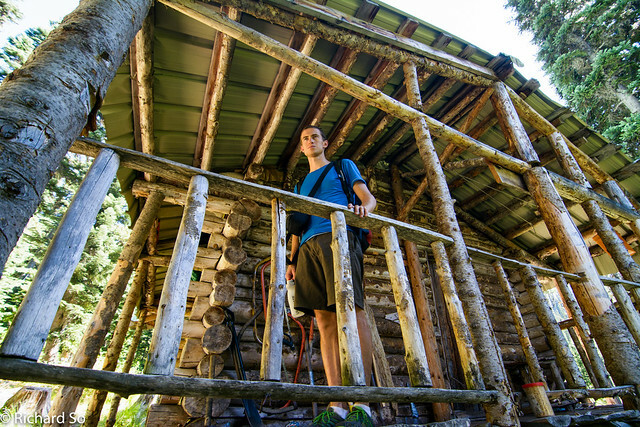 The old Lizzie Lake Cabin. A few years ago, I had an amazing ski trip here where I spent New Year's camped outside in a snowcave in -20C. We tried to warm up inside the cabin with the wood stove, but it was too drafty. From the cabin, we continued east, following a vague trail that took us up through meadows and talus to the creek draining out of Arrowhead Lake. 30 minutes from the cabin. This was our first swim of the trip, and set up another theme of the trip. 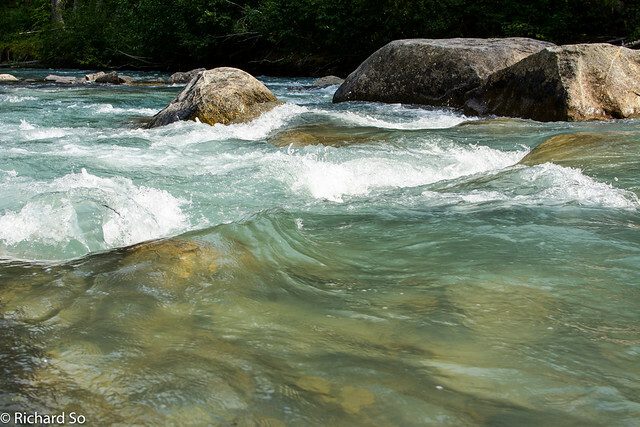 We joked that we would swim and bushwhack across the Stein Valley, not too far fetched from the reality. There are so many lakes in this area, and so little time for all of them, that we had to carefully pick which lake to stop and swim at. Hanging out at Arrowhead lake, post-swim. 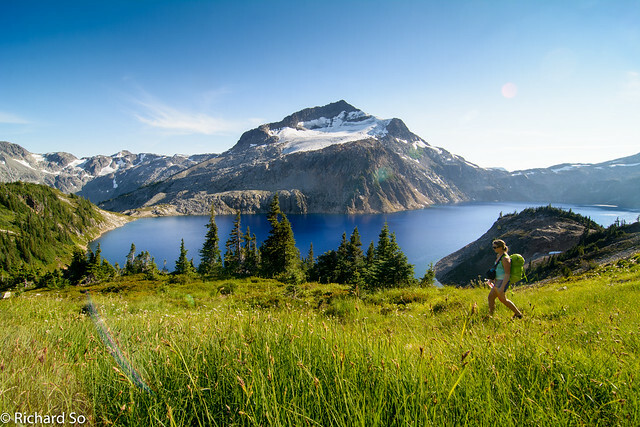 Maddy hiking above Heart Lake, with Cloudraker Mountain in the far left. 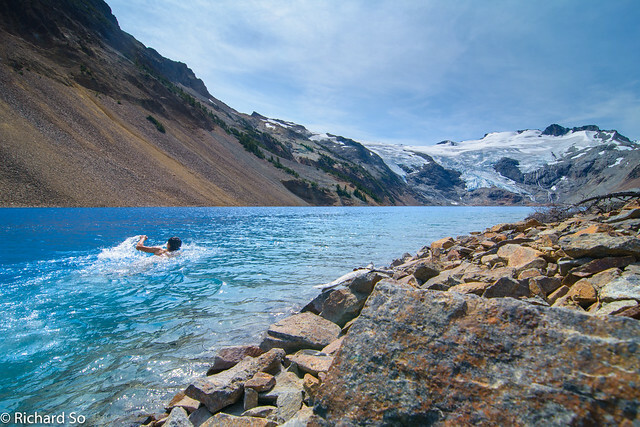 After a refreshing dip, we continued up past Heart Lake, to the col between Tabletop Mountain and Arrowhead Mountain. 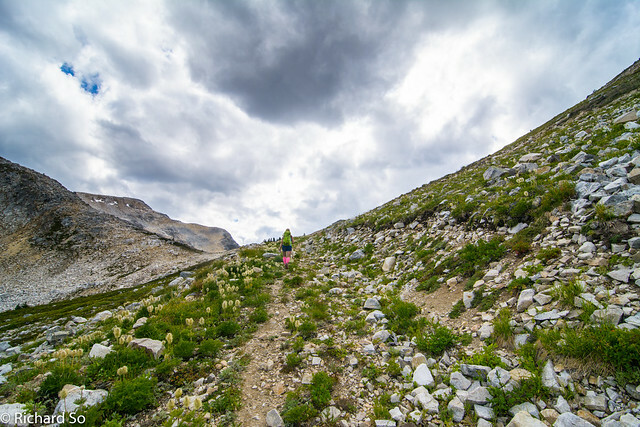 The best route to Cherry Pip Pass, is to continue northwest, following cairns, and eventually getting onto the flat ridge running northwest from Tabletop Mountain. From the ridge, it's easy walking down to the pass. We didn't get onto the ridge early enough, and ended up doing some more talus traverse and a steep heather climb to get back onto the ridge. We dropped down to Cherry Pip Pass, where the trail then climbs back up. 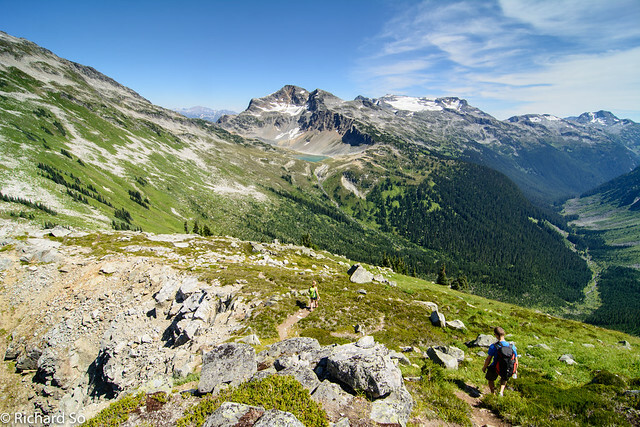 It's tempting to contour straight east to Caltha Lake, but the route goes higher to avoid steep heather, and then contours across talus slope to reach the meadows around Caltha Lake. There was one other tent here, but the owners must have gone off to climb Caltha or Tundra Peak (or probably both!). We had no time for peak bagging on this trip, and I promised myself to make another trip here soon. This would be a great spot to camp. It was now 3pm, and there was still lots of terrain to cover. 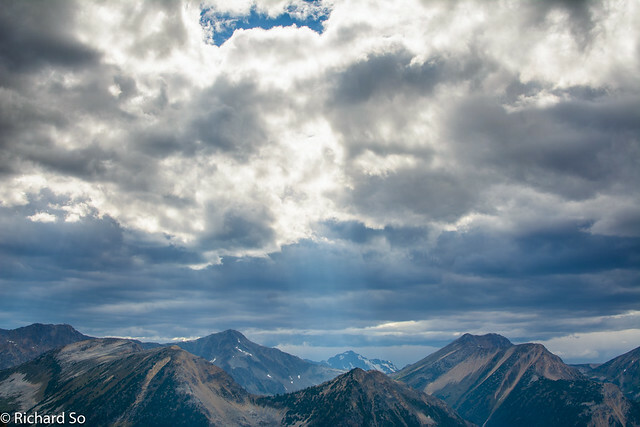 We worked our way up to the col between Tundra Peak and Caltha Lake, the western boundary of the Stein valley. 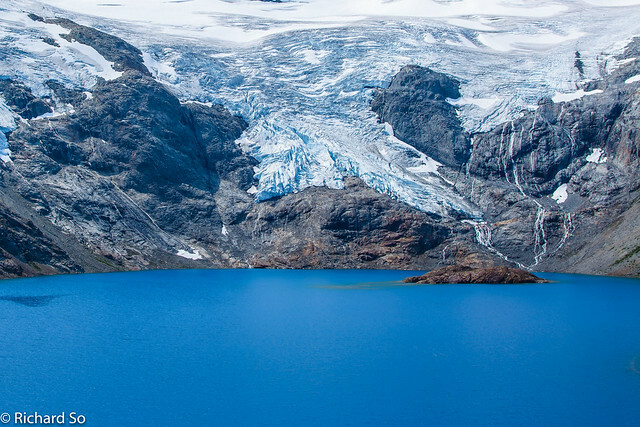 I've seen photos of Tundra Lake, but to see it's deep cobalt blue colour from above was incredible. 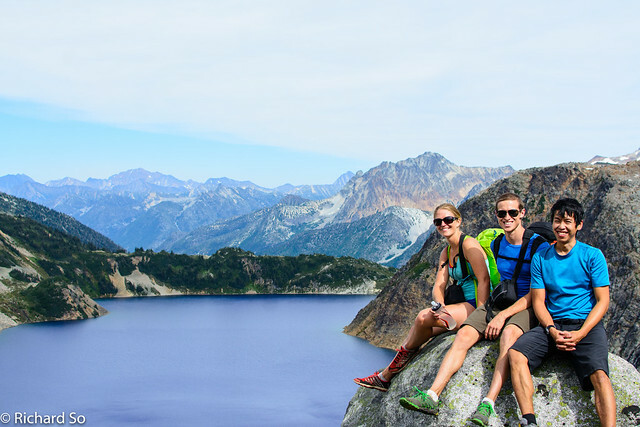 There are no other lakes nearby like it, with the snow capped peaks of the Stein Divide juxtaposed behind. The route now drops down from the col, and contours along steep talus slopes on the north side of the lake for nearly two kilometres. It's quite tedious with uncertain footing, but just another part of the vast and varied terrain encountered on a trip like this one. You will find this section challenging if you've never hiked on talus and moraine in the alpine, but it's not too bad otherwise. Tundra Lake is too beautiful not to swim in, and at 5pm, we all jumped into the lake to cool down. Rich in the air. Photo by Maddy Armstrong. Our view of Tundra Lake from above. Maddy swimming in the beautiful Tundra Lake. Maddy wandering in the meadows with Caltha Peak behind. It's just gorgeous here, so incredible. Our legs were still feeling happy, energy levels were good, and we walked past the Tundra Lake campsite, another one of those incredible campsites. It's high on a knoll above the lake, with panoramic views, situated well for both sunrises and sunsets. This would easily make it onto my list of top ten places to camp. The next goal is to gain the high west-east ridge above Stein Lake, and the route finding is not obvious. We contoured across more talus slopes before spotting a gully between cliffs that would take us up onto the ridge line with some scrambling. Going in the opposite direction, I don't know if I would have found this spot to descend. Our route was somewhere on the right side of the shadow line, scrambling up one of those gullies. Less steep than it looks from here. We were finally on the ridge top at 6:45pm, where we continued east as our shadows grew longer. The ridge, spectacular as it is, goes on and on for another 4km up and over various unnecessary bumps. But the soft evening light casted over the Stein Divide to the south soothed my tired legs. These peaks to the south have veils of receding glaciers on their flanks, draining north into Stein River and Stein Lake. The first sight of Stein Lake, a thousand metres below in the valley, comes as you traverse exposed scree slopes with cliffs below. We were finally losing the light, with the sunset at 9pm, and our headlamps came on as we neared the point where the trail descends. On the trees, spaced between the dusty scree slope, were old relics of BC Park trail markers, mostly faded to a dull white, and certainly not reflective. The trail actually continues down a scree gully just before reaching the end of the ridge as you are traversing the flank of it. But I wasn't certain where the trail went, and I thought going down the forested ridge was a safer bet in the darkness, especially with the exposure of the cliffs below. This did not work out as well as I hoped. Alex on the ridge top. 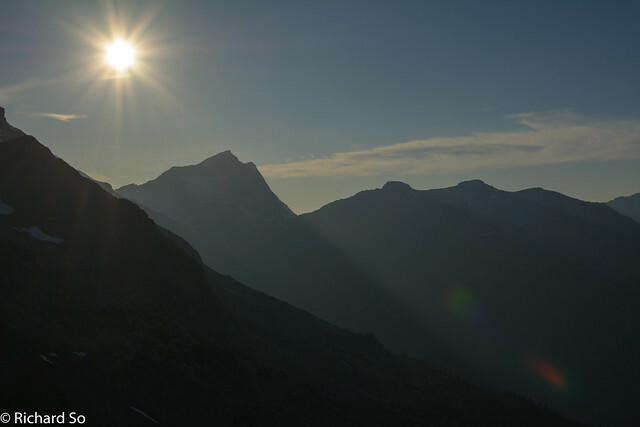 The setting sun above Meditation Mountain. Mount Klackarpun, Crevasse Crag, and Mount Skook Jim. 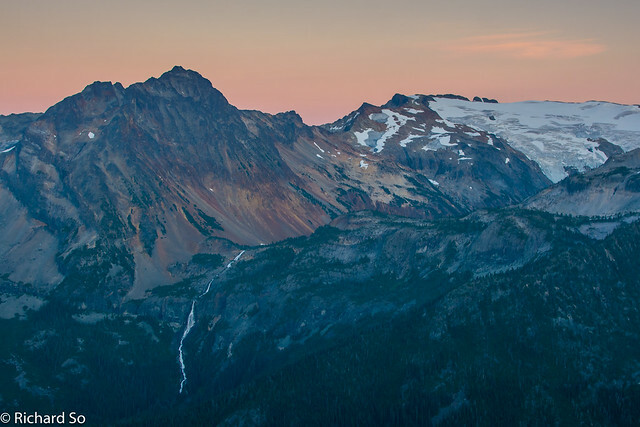 The headwaters of the Stein at sunset, with Elton Falls flowing out of the spectacular and hidden Elton Lake. Here's what BC Parks has to say about this section, as of Sept 2, 2015. "Stein Lake to Tundra Lake: Use caution and allow lots of travel time. The route around Tundra Lake is very rough and takes about 2 - 4 hours during normal late summer/early fall conditions. A backcountry toilet and food cache have been installed on a knoll in the north east corner of the lake where there is a good water source. Net elevation gain of about 1100 meters (3600 feet) from Stein Lake to the park boundary near Tundra Lake, and a net loss of about 700 meters (2200 feet) from there to the old Lizzie Lake parking lot. Very strenuous travelling in either direction. Water is available at Tundra Lake, Puppet Lake and the Stein River only. There are unreliable snowmelt streams at some points along the ridge. Do not underestimate the length of time and effort required to traverse this section of trail. This route should be considered only by experienced backpackers. Route finding skills are a necessity as many of the rock cairns marking the trail have fallen. White-out conditions can occur even during mid-summer. 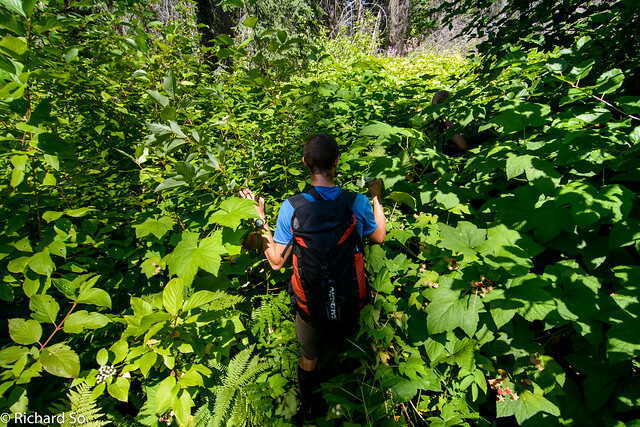 Expect to encounter some deadfall and erosion along this very steep and difficult section of trail." 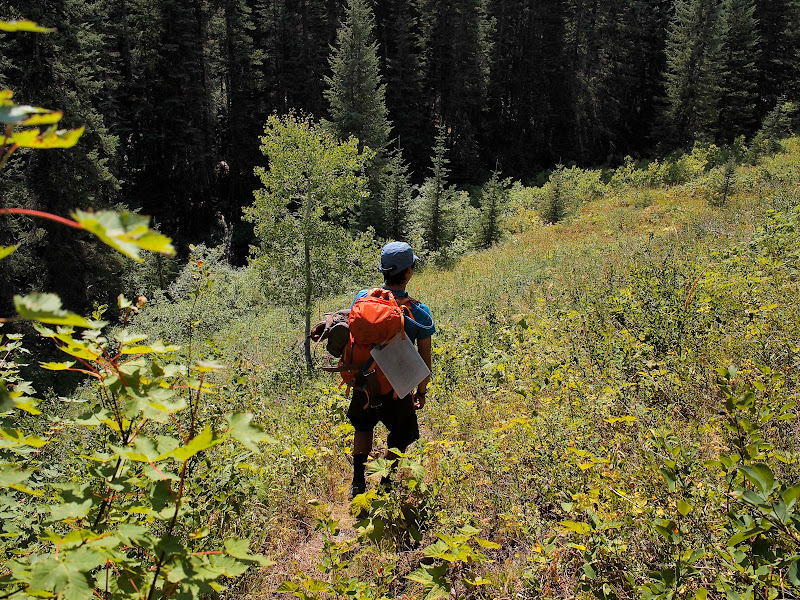 We bushwhacked down the ridge, and occasionally ran into a trail marker, sometimes while looking behind us. I would see a trail marker, and then see nothing ahead. Deadfall and slide alder compounded this, and progress was slow. We finally neared the valley bottom, and could hear the turbulent water of the North Stein below. I was near the confluence of the North Stein and the Stein River, 1km downstream of Stein Lake. The trail goes back upstream, contouring along talus slopes and one exposed section above the river. In the darkness, I confused a log spanning the stream for the cable car. I just wanted this part to be over, but the trail continued up. We spent nearly an hour prior, almost walking around in circles wondering where there trail was, until finally spotting a trail marker. The sight of the cable car, spanning the outlet of Stein Lake was a golden moment in an otherwise long and tiring night. There were other hikers happily asleep at the Stein Lake camp, and we walked past them towards the lake to cook our dinner. They must have been so confused to hear the footsteps of three tired shadows, stumbling through their camp at 1am. After 17 hours on the move, I finally laid down on a flat spot for a much needed rest. I can't recommend trying this section in the dark. Photo of the moon by Alex Gibbs. It was dark. Looking up at Mount Skook Jim and Mount Cline from Stein Lake the next morning. Alex and Maddy's campsite. At 2am, it was flat enough. Photo by Maddy Armstrong. Sometime the next morning, I remember hearing voices, and looking up to see the other eager hikers getting ready for their way. I had a half-conscious conversation with one of them, asking about the conditions of the trail ahead, the only thing I cared about after last nights adventure. More bushwhacking was all I heard, but how bad could it be with daylight? By this point, you're probably wondering why we didn't just stop at Tundra Lake, or Puppet Lake for the night, instead of pushing on with headlamps. 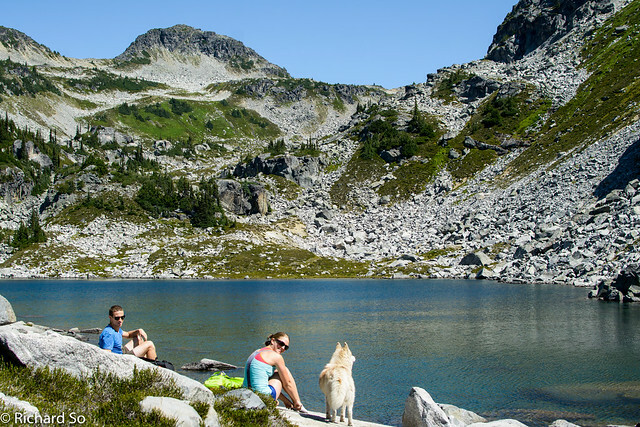 Our hearts were set on visiting Elton Lake, a rarely seen lake above the Stein Lake camp. 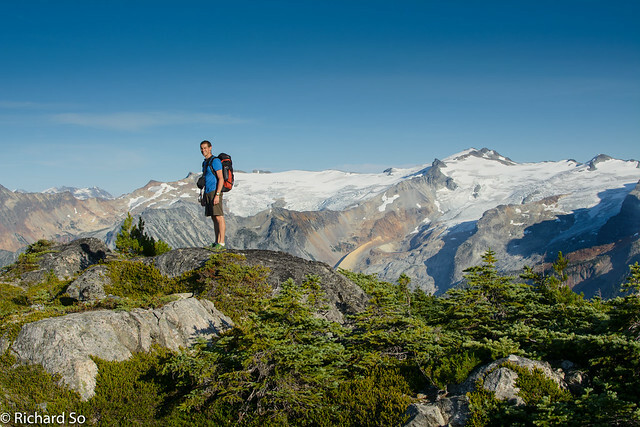 There is only a route to get there marked with occasional cairns, and involves a 800m vertical bushwhack. There is no trail to it, and has turned back more than one party. 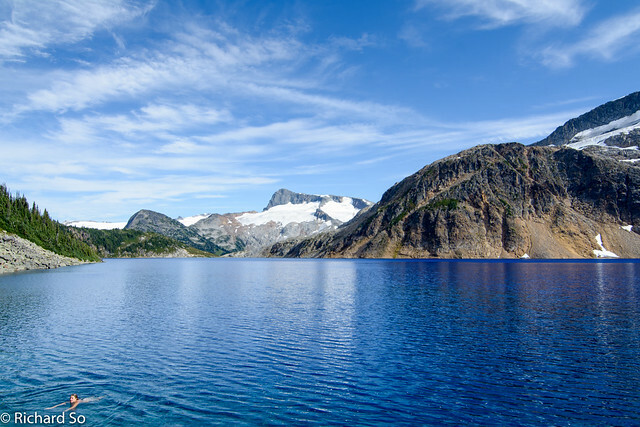 The reward is another deep turquoise lake, with a rock island in the middle and a stadium of glaciers behind. We slept in until 8am, had a quick breakfast and continued upwards to Elton Lake. 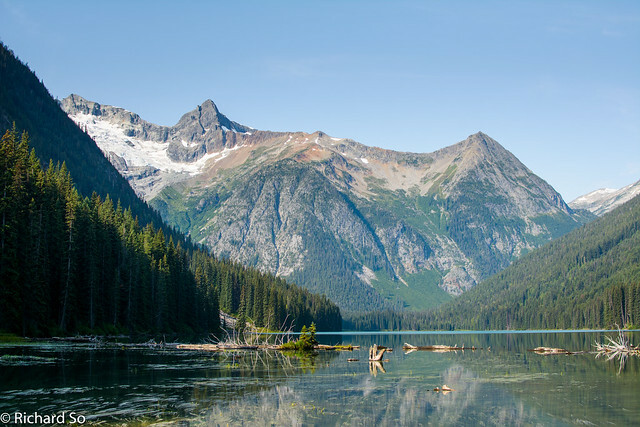 Elton Lake, with its rock island and glacial lined shores, is definitely a gem of the Stein Valley. 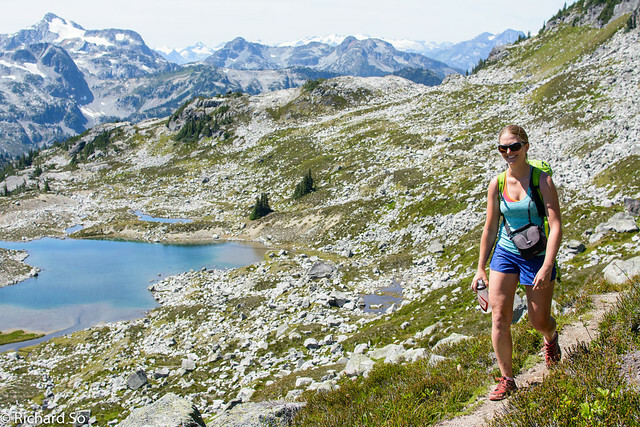 There are no signs leading up to Elton Lake, nor is there a defined trail of any sort. To retrace our steps, you should walk past the toilet, up to the helicopter pad. From here, start bushwhacking south onto the ridge in semi-dense forest. The ridge does open up, with some goat paths, and you may even see a cairn or two. 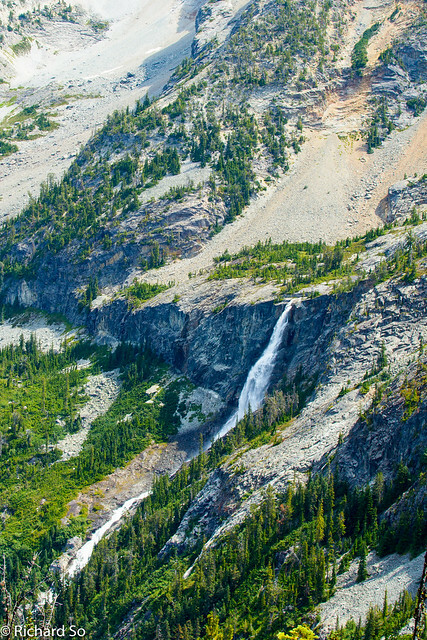 The goal is to continue travelling southwest along the ridge, where you will soon see Elton Falls, a 300m waterfall cascading down from Elton Lake. At 1750m, you should see some talus slopes to your left, which can be traversed towards the sub-alpine slopes beyond. It is not possible to contour straight over to the outlet of the lake due to some cliffs. 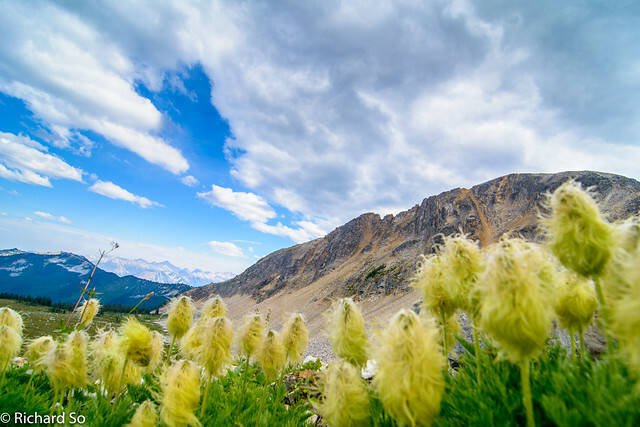 We walked along the plateau west of the lake, and then finally dropped down a steep scree slope to the shores of Elton Lake. 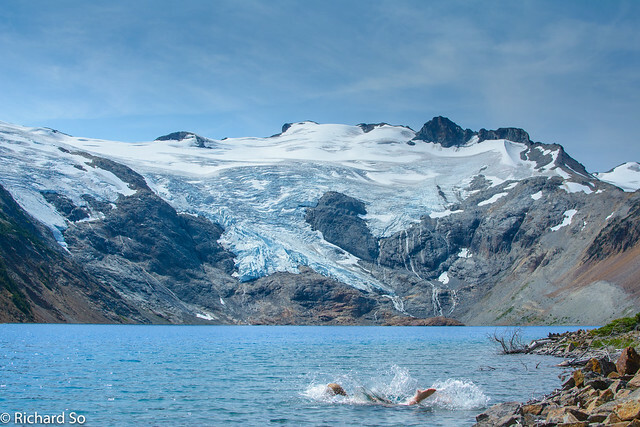 It was wonderful to jump into Elton Lake, and then look up and see all the glaciers draining into the lake. Swim time in Elton Lake. Scrambling back up the scree slope. There is probably a better way down to the lake if you look around harder than we did. We climbed back up the scree slope and onto the high plateau, around 12pm. There might be a better way to get down to the lake, but everything we saw was quite steep. We bushwhacked back down to camp, grabbed the stuff that we left in the bear cache and left the Stein Lake camp around 2:30pm. It's shocking the type of things that people leave behind in bear caches. In this one, right in the middle of the traverse, somebody had left behind some old clothing, and what looked like a Canadian Tire type tent. Going forward, I was mentally prepared for some bad bushwhacking and route finding difficulties after hearing all about it from Alex. I expected to lose the trail, and not to see any trail markers and to climb over countless deadfall, as advertised in the brochure. It actually wasn't that bad, until I walked past the turnoff to the cable car back across the Stein. I was ahead of Alex and Maddy, and was still following markers, although they were on trees fallen over. I turned around, heard voices from the river and the sound of the cable car gliding across the cables, and found my way back to the river shore. There was some flagging before a deadfall, indicating the turnoff that I missed. 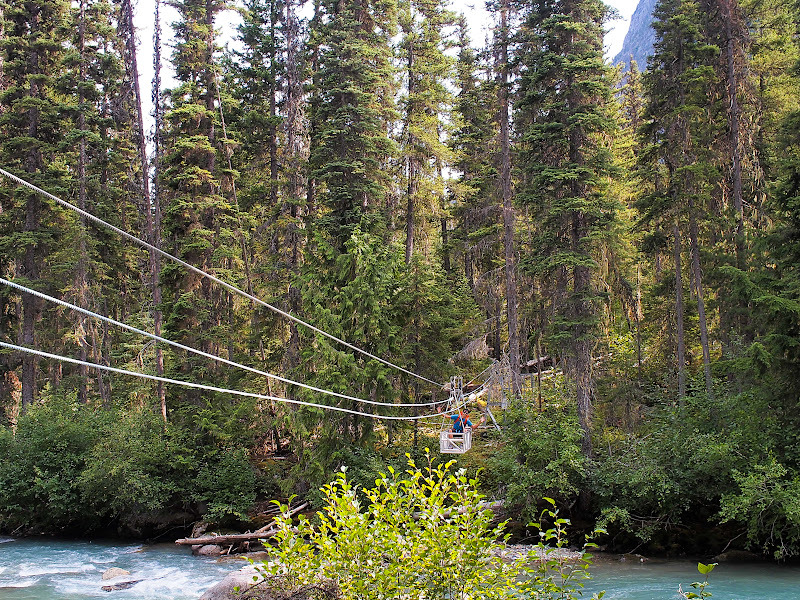 Cable car across the Stein River, photo by Maddy Armstrong. The trail is now on the west side of the Stein River and briefly follows flat valley where the Stein meanders with gravel bars, and then begins to climb above the mid-Stein canyon. We took a break at High View Camp, 150m above the canyon below, around 5pm. From here, we could look back at glaciers of the Stein Divide, and forward towards the vast area that was burnt in the 1996 and 2009 fires. 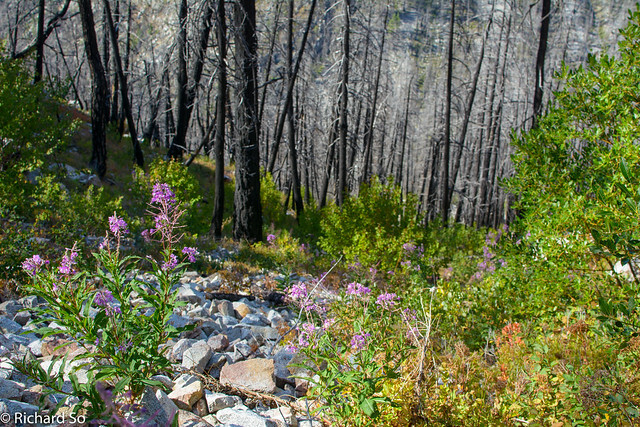 In many areas of the trail between High View Camp and Cottonwood Creek, the trail becomes obscured by fireweed, low brush, slide alder, devil's club and dead fall. The trail becomes slow going, and it was hard to maintain a 2 to 2.5 km/hr pace as we stopped frequently to look for the trail. 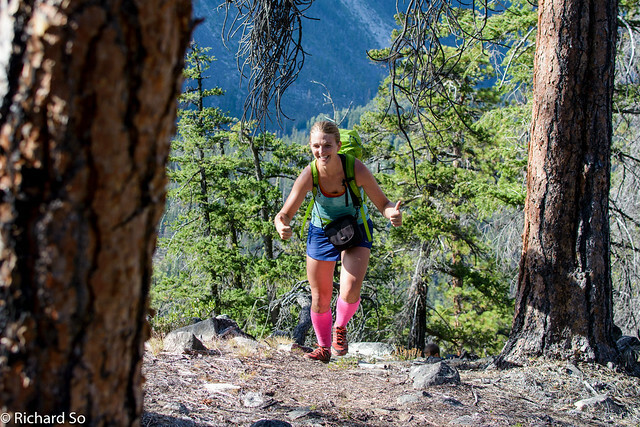 Keep this detail in mind if you plan on running the Stein in a day. 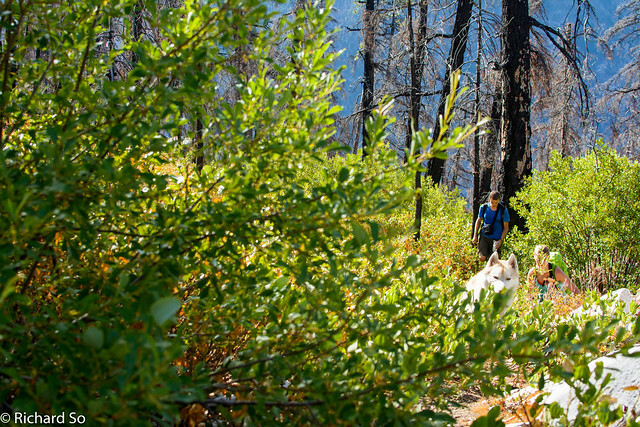 Usually, the trail is good close to campsites, probably where helicopters can land with trail crews to brush out trails, but quickly deteoriates beyond that. In the Coastal valley, everything grows so quickly. 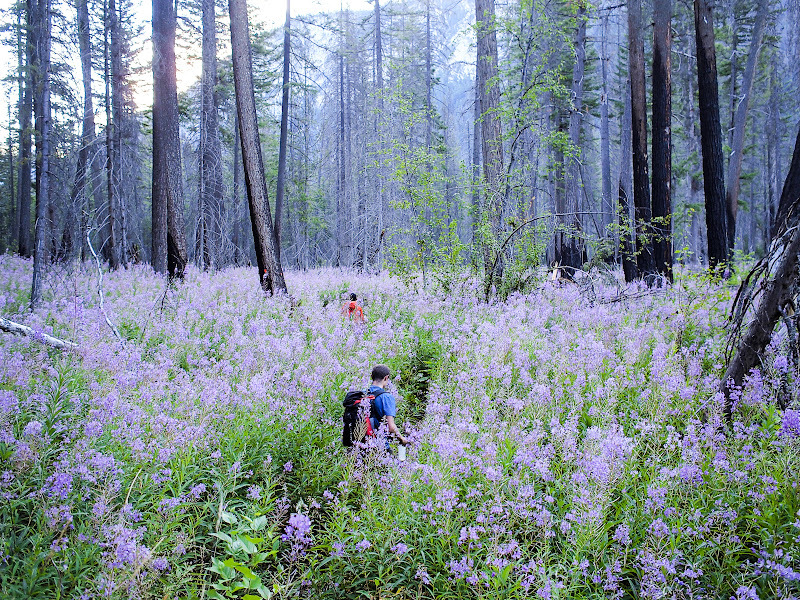 By now, bushwhacking along the valley bottom is just part of the adventure of hiking the Stein. Alex descending a dry and dusty section of the trail. Red trail markers! This is what the BC Parks website says about this section as of Sept 2, 2015. 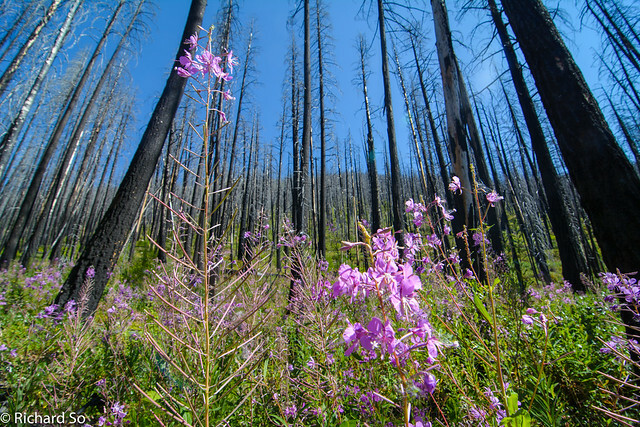 "Cottonwood to Stein Lake Trail clearing and brushing was completed between Cottonwood and Look-out Camp in 2013 and 2014but fireweed is dense in places. Currently, route finding skills and some bush whacking are required. Some bridges may be out at other crossings – be prepared to ford streams. Expect some blowdown." Repeat over and over again. Best done with light packs. 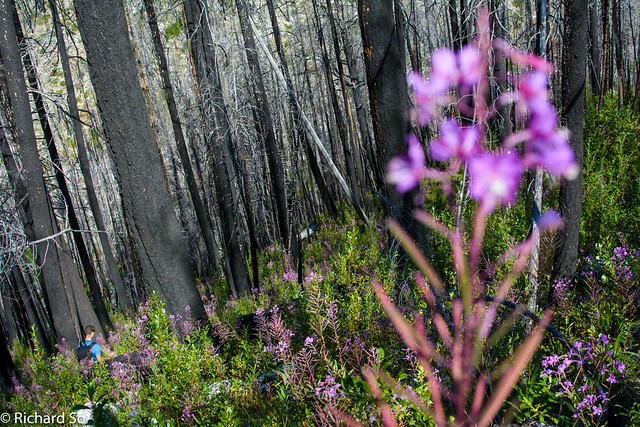 At least the overgrown sections with fireweed were pretty. We pushed on, walking past Avalanche Camp and Lookout Camp, and then turning on our headlamps in the long last kilometre to Logjam Camp. I knew we were close to it, but Alex and Maddy were concerned that we had missed it in the dark. 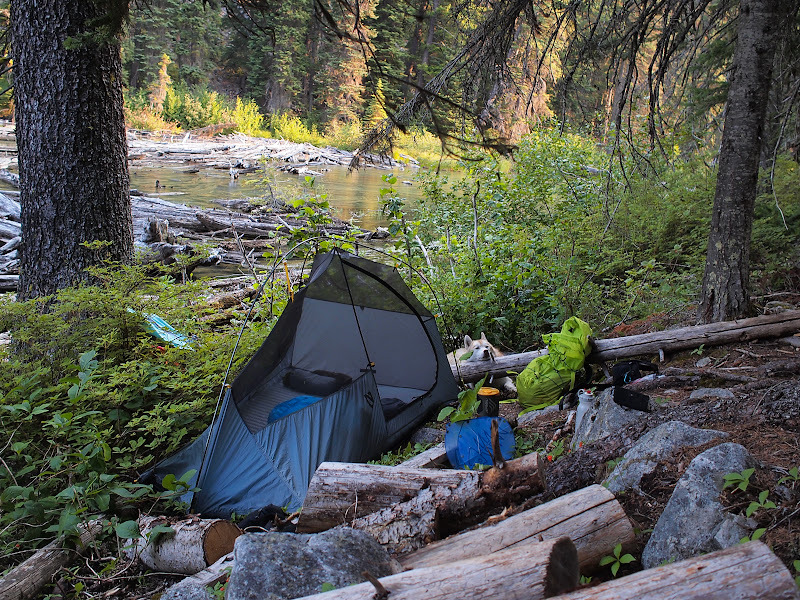 You could camp anywhere in a pinch, especially with the river nearby, but I wanted to go to the campsite so we would have a bear cache to use. I think we arrived around 9:30pm and jumped in the river above the logjam here, slowly down the Stein River. I stepped into the sandy river meander to soothe my tired feet. I was starting to get some blisters near the ball of my left and right foot. Something to do with that long seventeen hour first day. I slept within a tent on this trip, but Alex and Maddy brought a lightweight tent for the trip. I was too tired to notice the mosquitos at Stein Lake, but they were bothering me here, even with a mosquito tent for my face. I had to hide inside my sleeping bag, but it was uncomfortably warm in the valley bottom. I moved close to the river, hoping to get a cool breeze as I sweated away hiding from the bugs. The next morning, we were out of Logjam Camp by 6am. We had a long distance to cover, from Logjam Camp to Cottonwood Creek, and then up to Blowdown Pass and down to the car. 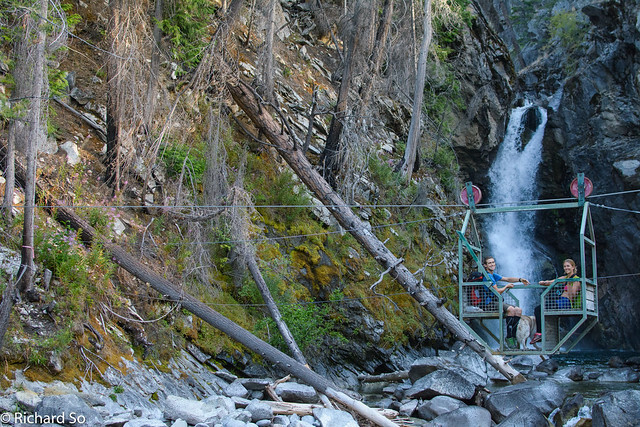 The trail is easy to follow from Logjam Camp to Cottonwood, and crosses two cable cars along the way, once across Scudamore Creek and again across Cottonwood Creek, with a view of a waterfall behind. For once, we could move faster with flat ground and a trail that existed. 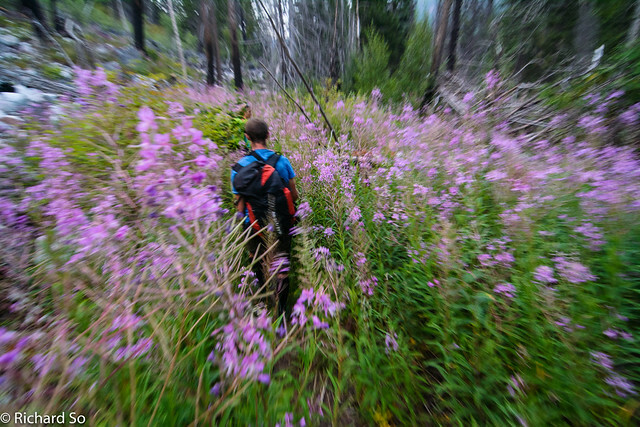 Wandering through the pretty fireweed. Photo by Maddy Armstrong. Crossing the Cottonwood Creek cable car. I read that the trail markers were burnt, or faded and hard to see with lots of deadfall along the way and the trail was hard to follow. 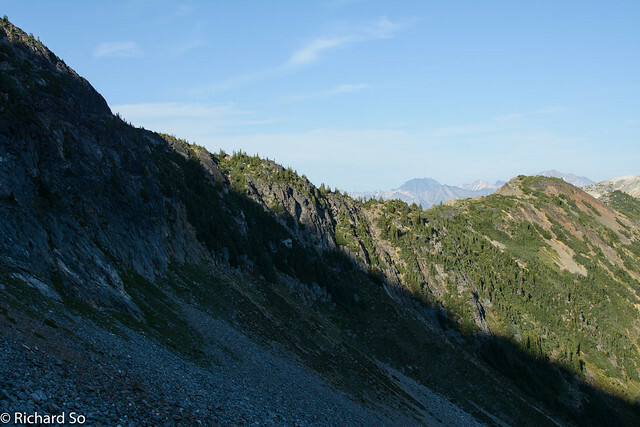 From Cottonwood Creek Camp, turn left at the sign pointing up to Blowdown Pass, and follow cairns and a rough trail bed to the top of the Unnecessary Knob. Drop down a short distance beyond the knob, and continue up the burnt hillside. I was mostly aiming to go up and left, giving up on finding trail markers and just bashing up through the fireweed and sooty deadfall. Eventually we picked up the trail, which contours north high above Cottonwood Creek, at approximately 1200m, before dropping down to Cattle Valley Creek (10:15am). While there were some bleached trail markers, there were also new red trail markers, and evidence of recent chainsawing that summer. I think it was a group from Lytton or Lillooet that put in the effort to clear over a hundred trees fallen across the trail. Thanks! This way to Blowdown Pass. One of the few signs in the Stein Valley. Photo by Alex Gibbs. Fast walking in the burnt forest, photo by Alex Gibbs. 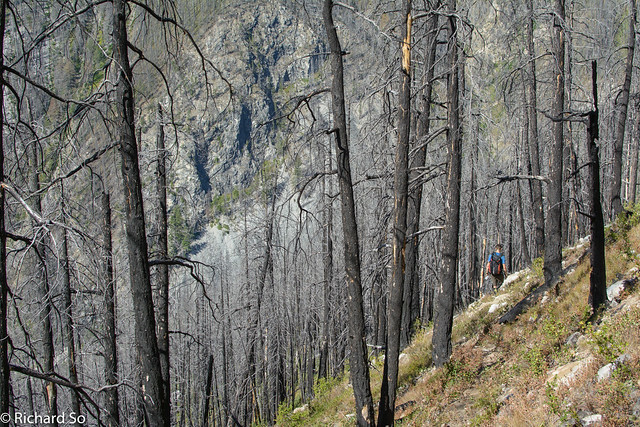 Beyond Cattle Valley Creek, the trail continues across dead stands of tree, all burnt in recent forest fires. Even though it was a calm day, we saw heard three trees falling over, one of them only a hundred metre away from where I was standing. Don't hike this section in the rain, or when it's windy unless you like to take chances with slope stability and falling tree hazards. There is an established camp site at Cottonwood Forks Camp, the junction between the South and North Fork of Cottonwood Creek. We arrived around 12:30pm. There's a gigantic table here, with the names of hikers inscribed on it. 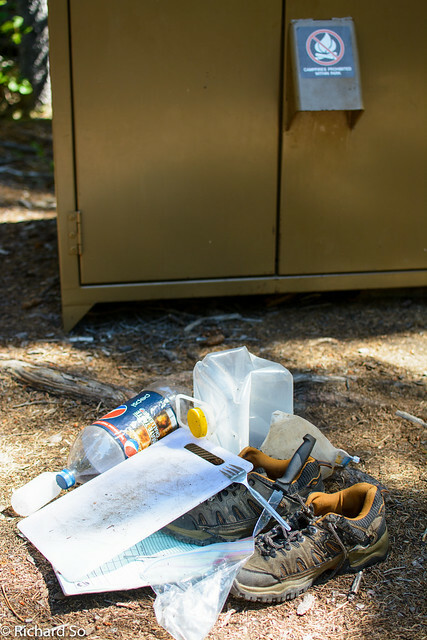 Inside the bear cache, I found some more unwanted presents left by other hikers. There was a empty 2L 7-Up bottle, 10L water bladder, a canvas belt, a pair of chewed up dayhikers, fork, knife, a journal with a entry of two sentences, and a cutting board. Who brings a cutting board on a trip and leaves behind their shoes? Alex and Maddy took off, while I did some creative packing, using the belt to strap the cutting board and shoes in place on the outside of my 35L backpack. I caught up to them in the forest, where they were passed by a cutting board for the very first time. Thanks again to whomever did the trail work here. It was a pleasant stroll through the forest, aside from getting caught up in dense alder where the trail crosses two avalanche paths. There is an old mining road once you leave the forest, which traverses and then climbs up to Blowdown Pass, ten kilometres long. We were all suffering now, either with blisters or muscle problems. I thought my blisters under my feet were bad, until we all stopped to take off our shoes. Maddy showed me her blister, between her big toe and second toe and I stopped complaining about mine. 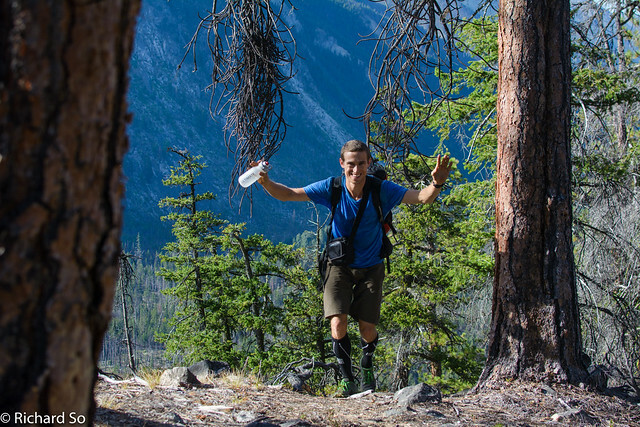 Even Harrison, who usually has plenty of energy was reduced to a slow trot on the climb up to the pass. But dogs have secret stashes of energy for chasing marmots, and every so often he would run off the road in a hopeless pursuit of those furry creatures in the meadows. Final climb of the trip along the old mining road to Blowdown Pass. Rich and his cutting board. Another Stein Valley sign! Photo by Maddy Armstrong. We reached the 2200m pass at 5pm, and the only thing left was another long plod down the logging road to the car, parked at 1550m and 5km away. My feet were hurting on the walk down the road, so I just speed it up and started running down to minimize the suffering time. By 6:30pm, we were happily down at the car, drinking beers stashed in the creek and finishing two bags of chips. We drove back down the Duffey, retrieved the other car at Lizzie, and finished off with dinner at the Pony. The Stein Valley traverse lived up to my expectations and I recommend that you check it out. Go and embrace the trip knowing that it will be a wilderness experience. Be sure to visit Elton Lake. A fit party with light packs should be able to complete route from Lizzie to Blowdown in three to five days with early starts and late finishes and good route finding skills. I know I will have to re-visit the alpine area around Lizzie. 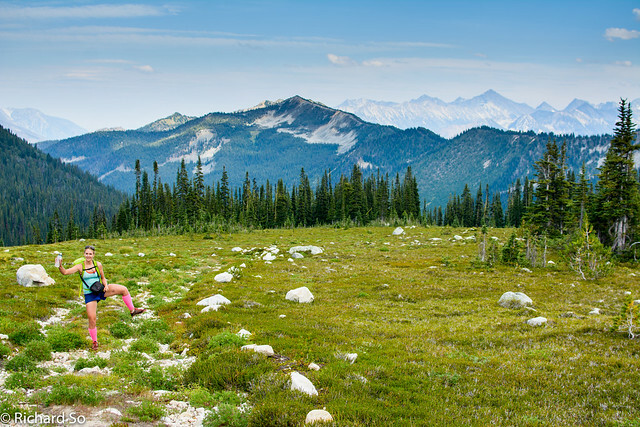 As much as I enjoyed bushwhacking through the pristine valley bottom, it's still the high alpine and meadows that warms my heart when I think back about this trip. There are some stunning ridge lines in the area, and I now dream of a high route traverse along the ridge line from Blowdown south to Lizzie Creek. Can't wait to do that! Beers and chips at the truck. 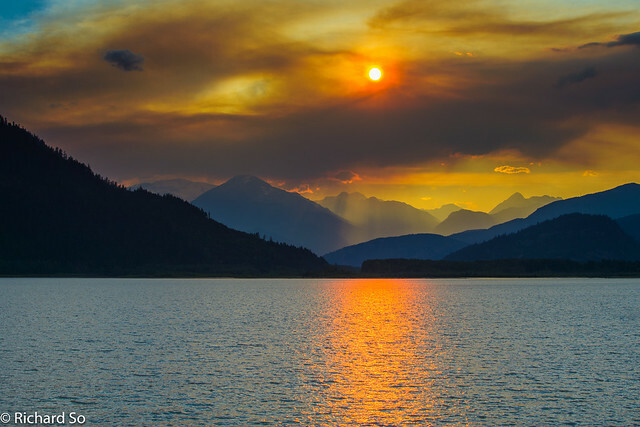 Smokey sunset over Lillooet Lake, due to the forest fires in Boulder Creek. Thanks for the great blog post. Great descriptions of the journey and excellent photo too! Bannerizer makes it easy for you to promote ClickBank products with banners, simply visit Bannerizer, and grab the banner codes for your selected ClickBank products or use the Universal ClickBank Banner Rotator Tool to promote all of the ClickBank products. Thanks so much for making this blog post. There is very little current information on the blowdown pass section.